*We are accepting new applications at this time. *Registration for the 5/19 Fair will close at 6pm on 5/17. 1. Click on the New Participant Application (rev. 3/2019). This is a fillable PDF – you can type directly in the form and save it to email or print it off and complete it manually. You must DOWNLOAD the form in order to type directly in it. 2. Enter your payment preference and information on the form. You can include card information or request a PayPal invoice to be emailed to a provided email address. 3. You will be sent an email with a brief questionnaire to complete and email back. If your registration request is accepted, your payment will be processed and a confirmation email will be sent to you. Spaces are not reserved until your payment is processed and you receive a confirmation. 4. 4’X2′ Reader Tables are available on the dance floor. These spaces are for those offering 1-1 consultations only – in a dimly lit, calm environment. Our full 8′ table spaces are available throughout the venue and readers may select either option (4’X2′ on the dance floor or 8′ elsewhere) depending on their preference and needs. The dance floor is for readers only but readers have the option to choose any space in the venue that is available. 5. Only one representative from a MLM company is accepted for each Fair event. 6. Tables, chairs, electricity & free wifi are all provided at no additional charge. 1. If you have submitted the full registration application and participated in the past, you are in the system and do not need to complete that process again. 2. Participants will be given a Returning Exhibitor Form on the day of the Fair, and can turn that form in then to sign up for the next Fair. 3. Returning participants are included in our “First Refusal” program which allows them to renew their previous space location before it is open to any other participants. The First Refusal period is active for the 2 weeks after each Fair event. First Refusal discounts are also available to returning participants if their payments are made within the specified time period. 4. When you submit your renewal request, your payment will be processed and a confirmation email will be sent to you. Spaces are not reserved until your payment is processed and you receive a confirmation. 5. Contact Jason Carlson if you need to pay over the phone, have a PayPal invoice sent your way or if you have any questions about signing up. The 81 Club is a unique venue with a lounge feel. There are spaces available in different areas that offer different energy and varying lighting. If you have not joined us before, we suggest that you join us as a guest so you can get the feel of the venue and see what table space options would best fit your needs. Table sizes: Dimensions for reader tables on the dance floor are: L: 3’9″, H: 2’6″, W: 1’11”. Dimensions for 8′ tables are: L: 8′, H: 2’5″, W: 2′. 8′ table spaces vary in depth. If you need a deep space to set up a massage table or something else, indicate so on your registration form and it will be reserved for you if available. View a current copy of your Participant Agreement here. We ask that you stay familiar with the Holistic Fair guidelines. 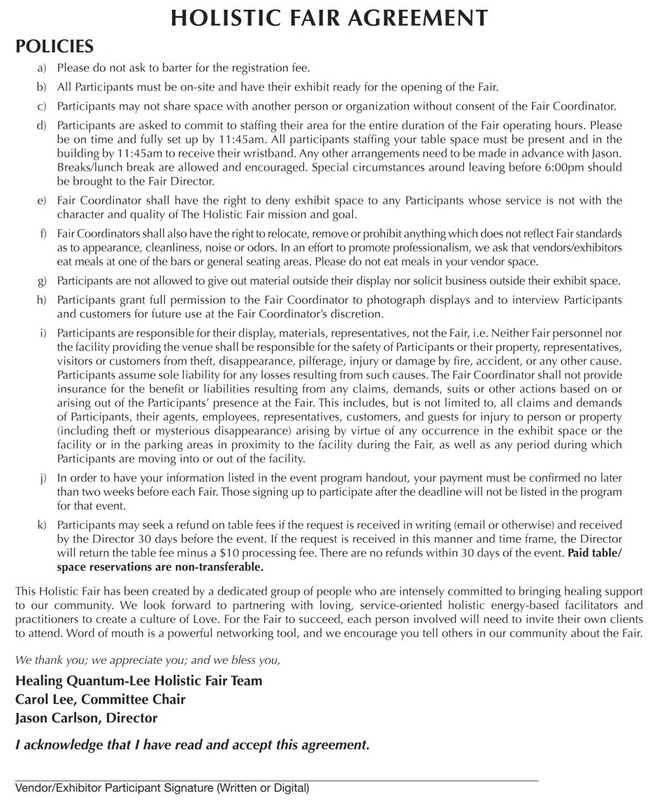 The Participant Agreement is updated as needed in an effort to maintain harmony between the Holistic Fair Staff, the venue, our Participants and our guests. The Fair began in January of 2013 and we moved to our current event center at Billy Bob’s January of 2015. We have been steadily growing in our venue and area. We promote the Fair using Facebook, Meetup, posting flyers in retail spaces with our sponsors, Constant Contact, Ft. Worth Stockyards website, the Holistic Fair website, word of mouth, and various other rotating online and print advertising. Jason Carlson offers marketing materials through his business, Sigma Mailing Service. Services include graphic design, logo design, flyers, table top signs, vinyl banners, pens, business cards, postcards and most other promotional materials. Contact Jason directly for price quotes and product availability. Ad space is also available in the Event Program and on this website for returning Vendors/Exhibitors in an effort to help you promote yourself and grow your business. We will design and run your Ad for $35.00 (for one Fair event – the renewal fee is also $35.00). View a sample of our Event Program on the Holistic Fair Main Page. Contact Jason for pricing and space availability.